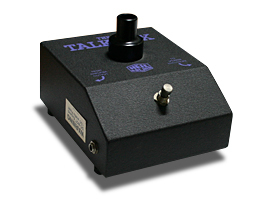 Jim Dunlop Heil Talkbox became a famous talkbox for many musicians favored it such as Peter Frampton, Joe Walsh, Slahsh, Alice In Chains, and Aerosmith to name a few. Probably because of its product design for use with guitars, the sound characteristic is strong in the mid-range and has a hard lean sound compared to other talkboxes. You could listen to the sound at the Jim Dunlop site.